The first time I heard Fanfarlo, I figured they were Swedish. The trumpets. The violins. The fey vocals and sweeping choruses. 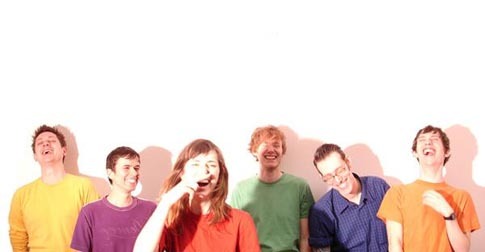 Scandinavians are the only ones who dare to sound this much like Belle & Sebastian these days. But I was wrong. They're not even Scottish, though that's closer. Fanfarlo are in fact from London and with only three singles have already garnered much praise, including an all-important nod from David Bowie. (Mr. Byrne, you are slipping.) Carrying on a fine tradition of pop that can be traced back to Orange Juice (their MySpace headline "No More Rock and Roll for You" is a quote from OJ's "Poor Old Soul"), Nick Drake and the Zombies. Singer Simon has one of those voices that are going to melt a certain type of girl's hearts. UPDATE / ASIDE: I was kind of right all along. Singer Simon Aurell is Swedish. You can tell by his accent, which is nearly the same as Pelle Carlberg's. Everything makes sense now. Fanfarlo's brand-new single "Fire Escape" is their best yet. 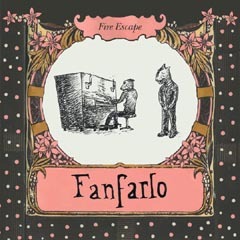 If I hadn't already declared Cut Copy's "Hearts on Fire" my Official Summer Jam on Blogfresh Radio, I would be inclined to make Fanfarlo's "Fire Escape" my pick. It's just about perfect. Maybe the Summer Picnic Jam -- it's the cucumber sandwich of pop songs. Hey, cheers for this link, they sound great. I had fun listening to these guys!